Many couples choose their Fertility doctors because of their preference towards a characteristic of the doctor, however, many more choose to undergo their IVF treatment under a doctor or a centre because of the perceived success rates of the doctor or a centre. A published survey in the UK revealed that success rate of a centre or a doctor is the key determining factor for the decision of going through IVF in a particular Fertility Centre. So what happened in between the time after we put those embryos back into the uterus until the time we test for pregnancy? The answer to this is that nobody knows. As doctors we placed the embryos back, and nobody actually knows when and how the embryos get implanted, and what determines whether the embryos will get implanted or not. Many people had tried various things, complete bed rest, baby aspirin, steroids, hanging the legs up and etc etc etc. Studies after studies failed to show any good recommendation on what we should do to improve the implantation rates. Some people believe that by performing a Pre-implantation Genetic diagnosis (PGD) can improve the implantation rates. There is some logic behind this: by selecting the normal chromosomal embryo to put back into the uterus, the chance of implantation increases. However, years had gone by with such a practice being implemented in some centers and there is only a marginal increment in pregnancy rates. A recent study conducted at KL Fertility Centre (Monash IVF, KL) showed some interesting data. We looked at all the women going through one IVF and divide them into 3 different groups by age. Women who are under the age of 35 have 60% chance of getting pregnant during the fresh cycle when we put back the embryos into their uterus. 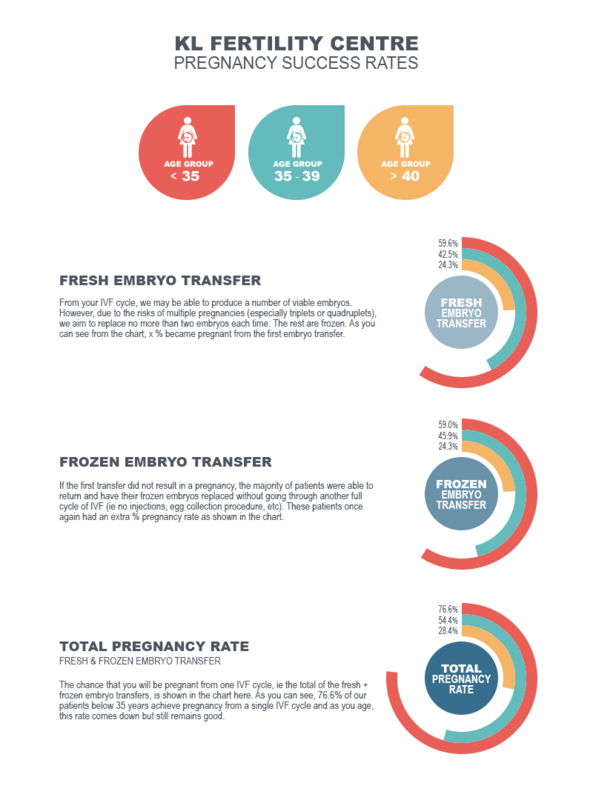 If they do not get pregnant during the first round and have good embryos which can be frozen and to be used in a later date, the chance of them getting pregnant by replacing 1-2 frozen embryos is around 60%. By the time this group of women exhausted all their embryos which were produced by ONE IVF treatment, the likelihood of them having at least one baby is around 80%. This translates that 4 out of 5 couples who are under the age of 35 will get pregnant with just ONE IVF attempt. The success rate is about 60% in women between the age of 35-40 with the same trend observed. Even for the group of women who are in the range of over 40 years of age, the success rate is close to 30%. This certainly have a significant impact on the way we think….we now know that the chance of pregnancy is extremely good by just having ONE IVF without even having to subject the embryos to expensive and potentially hazardous pre-implantation genetic testing. The key thing is to just keep moving on!!!!! This entry was posted in IVF, IVF Success Rates and tagged doctor, Fertility Centre, fertility doctors, IVF, KL, Malaysia, success rates. Bookmark the permalink.